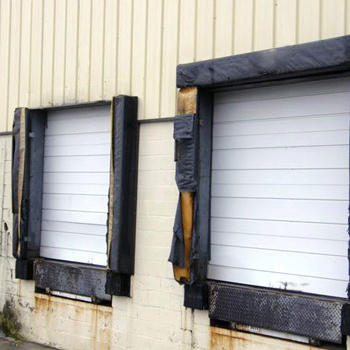 Air ride trailers, shuttle trucks, slopes, and time are common factors leading to the break down of loading dock seals and their components. For loading docks wearing out faster than expected the solution can often be as simple as a recover with a higher base fabric or wear pleats, while in other cases a dock shelter may be necessary to fully alleviate any problems. To help you get back on track, loading dock supply offers a full line of standard or custom replacement pads complete With options like wear shields, high tear fabric, fire retardant fabrics, colored fabrics and more. Ineffective and missing seals are outlets for conditioned air, as well as potential portals for the ingress of pests, vandalism, and other environmental nuisances. To get you back up and running without the need for an entire set of new pads, Loading Dock Supply offers replacement pads available in a a variety of standard or custom shapes and dimensions. Rather than replace your damaged seal pad with a new one, or wait till the foam becomes too damaged to repair, protect your investment with high quality vinyl recovers. Available in sets, or for specific seal components, vinyl dock seal recovers offer an opportunity to not only utilize a stronger base fabric, and wear shields, but also a lower shipping and product cost than completely new compression seals. Loading Dock Design is a key factor to your Dock Seal Efficiency! Fill out a dock seal recover - replacement pad worksheet today! Have a small tear that needs patched up? Let us know, loading dock supply offers dock seal patch kits ready to ship same day or next day.